aib: Give it to God. This afternoon in our H.E.A.R.T. support group, my ladies are going to be making their very own "Give it to God" boxes. 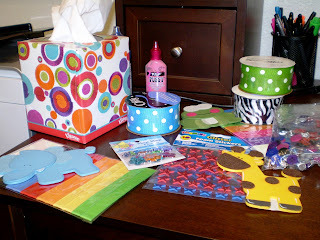 We are taking ordinary tall tissue boxes that are empty, and decorating them with fabrics, puff paints, beads, ribbons, stickers, flowers and jewels. The purpose of the boxes are that when the ladies have something on their mind and in their heart that is worrying them, they will write that concern on a piece of paper and put it in their box. (Give it to God). The only way that this box works however, is if you really DO let go of the troubles and let God take over your worries through prayer and trust. I have a group of such amazing ladies that are so positive and ready to move on with their lives. I think that this project will be something that brings them peace and that they will enjoy. I will post pictures of our creations soon!